Action created by Chris East (subscriber contributor) © All rights reserved. For those wanting to explore Color Infrared Photography, these actions will give some interesting effects. Using the swap red/blue color channels produces an almost natural blue color for the sky, leaving the remainder of the scene relatively untouched. The effect is rendered on a separate layer so you can simply delete the layer if you don't like the result. This action works best if you have a scene with a copper-colored hued sky. Possibly, your digital camera won't produce this color. In any case, either of these actions (swap blue/green or swap red/blue) do produce interesting effects. This action seems to have little use beyond Infrared Photography. Download & Installation Instructions: Please note that the action has only been tested for Adobe Photoshop Version 7.0. It might work on lower versions but it has not yet been confirmed. All tested versions will be posted on this page as soon as results have been confirmed. The download of the Chris's Photoshop Action is extremely fast due to the small compressed file size. The name of the file is: chrisswapchannel.zip. The chrisswapchannel.zip file must be unzipped to extract the action file named swapchannel.atn. If this is an upgrade to an earlier version of the Swap Channel Action, delete the old action version from the Adobe Photoshop action menu. 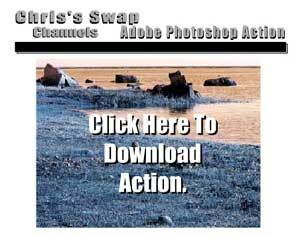 The chrisswapchannel.atn file must be placed in the Presets/Photoshop Actions folder that is located in the Photoshop program folder. Click on Photoshop Help ---> Search ---> and enter "action" for the searched word. The Adobe Photoshop section entitled "Saving and Loading Actions" explains the exact location and procedure for the action file depending on the type of operating system you are using. In the Adobe Photoshop Action Window, click on the little circular arrow located in the top right hand corner of the window. Select Load Actions and then select the file chrisswapchannel.atn. The new action will only be displayed if you copied the chrisswapchannel.atn action file into the correct directory. Please DO NOT send any email questions to Outdoor Eyes regarding the installation or use of the Chris's Swap Channel Action. Thank you.